For the seasoning salt, grind sea salt, black sesame, pepper, and a part of the sugar in a mortar and pestle. Place eggs in boiling water and cook for approx. 8 - 9 min. Transfer eggs to a bowl of cold water. 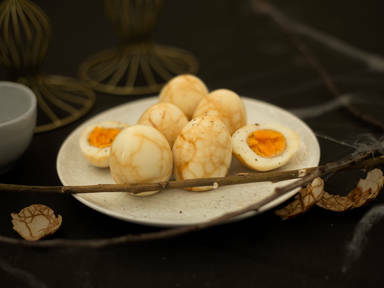 Once eggs have cooled, gently crack eggshells with the back of a spoon and set aside. For the marinade, bring water, soy sauce, tea, remaining sugar, ginger, cinnamon, star anise, and bay leaf to a boil in the saucepan and let simmer for approx. 10 min. Transfer eggs to marinade and simmer for approx. 20 – 30 min. Let steep in marinade for at least 60 min. or ideally overnight. Carefully peel eggs. Halve if desired. Sprinkle with seasoning salt before serving.